On Tuesday 5th December six members went to a Christmas Tea by the kind invitation of our friends at Christchurch, Portsdown branch. There was a quiz on the Initials of Names for Carols, and seasonal songs, we sang carols and there were readings. A lovely tea of sandwiches, savouries, cakes and trifle together with mugs of tea or coffee was served. As always we were made very welcome and had a really nice afternoon. 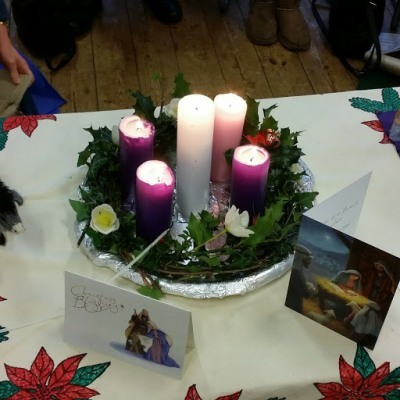 We held our Advent Miscellany on Thursday 21st December. Starting with a theme of They could have said “No”, with illustrative readings, we considered the reactions of Mary, Joseph, the Innkeeper, the Shepherds and the Magi. Following this members read from poems and articles. Then Sue (Andrews) told us about the Travelling Nativity which has been passed between families in St George’s Parish during the Christmas season, since the 1990’s. The festive tradition dates back to Mexico 400 years ago and is very popular in Latin American Countries. Our set is beautifully knitted and each host family gets to keep its own Angel to put on their Christmas Tree. Our stable was made by Pat Anderson. We finished our afternoon meeting as usual with tea and cake. 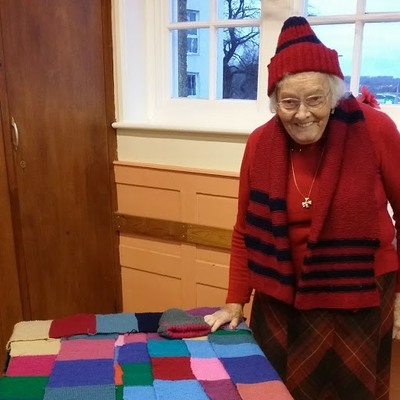 Jennefer showed us long strips she had knitted to be sewn together to make blankets, also hats and scarves to be donated to the Two Saints Charity. 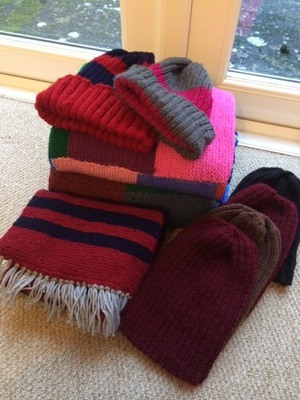 A moment of sadness as Sue showed us the beautiful garments she knits for the Maternity Unit at the QA hospital, from a pattern supplied by the Mothers’ Union. 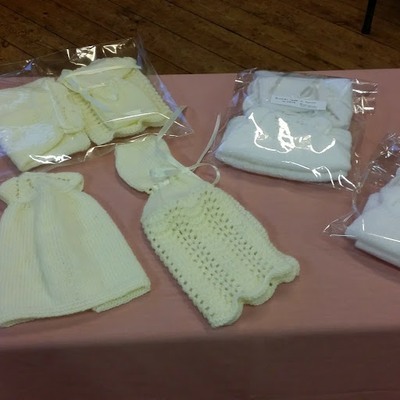 These, in pale shades or white, are for babies, still born, two identical sets: one to dress the infant, the other for the grieving parents to keep and hold. Called Angel Capes and Angel Gowns, these tiny baby clothes were a sobering reminder that not all births are joyful occasions. 38 ladies and 2 gentlemen came to our Epiphany party on Thursday afternoon, 18th January. At first the hall seemed rather empty and I was worried we would have more food than guests, but by 2.30pm so many people had arrived I was more anxious that the usual wrapped, surprise gifts would not be sufficient in number. Our Diocesan President, Rev Elizabeth Groves led the opening prayers. Margaret and Pam read poems, and Wendy had prepared a quiz on food, clothes, cars and trees. Then it was time for tea, a buffet laid out on long tables at one end of the hall. With sandwiches, savouries and cakes there was a good selection, with cups of tea and coffee. At the end everyone seemed to have had a good time and received their gift, so I breathed a sigh of relief and re-adjourned to the kitchen. On Wednesday 31st January five members plus Andrew our book-keeper attended the Deanery Subs Day Coffee Morning held in the Heath Room, at Denmead. While Andrew dealt with the morning’s business we browsed at Norma’s MU Merchandise table where new Easter cards were available, and enjoyed coffee and biscuits, and a raffle.